Since I am the one hosting JADE's Traveller Campaign: Interstellar Exports, I took the time to sit down and throw together a whole bunch of maps for the game. Personally I really like using maps in my campaigns. I find they help me figure out the setting and really create a believable scene for my players to interact with. So since the first chapter of Interstellar Exports takes place in a galactic sub-sector I knew I would need a lot of maps to cover all of the possible ground that my players could cover. My first step was to map out my Galactic Sub-Sector. I needed to know where my players could end up, in advance, so that they (and myself) could plan for their adventures. Using the Sub-Sector Hex Grid provided in the back of the Traveller Core Rulebook, I scanned it, reversed the colours in GIMP, and added a couple stars with an air brush. 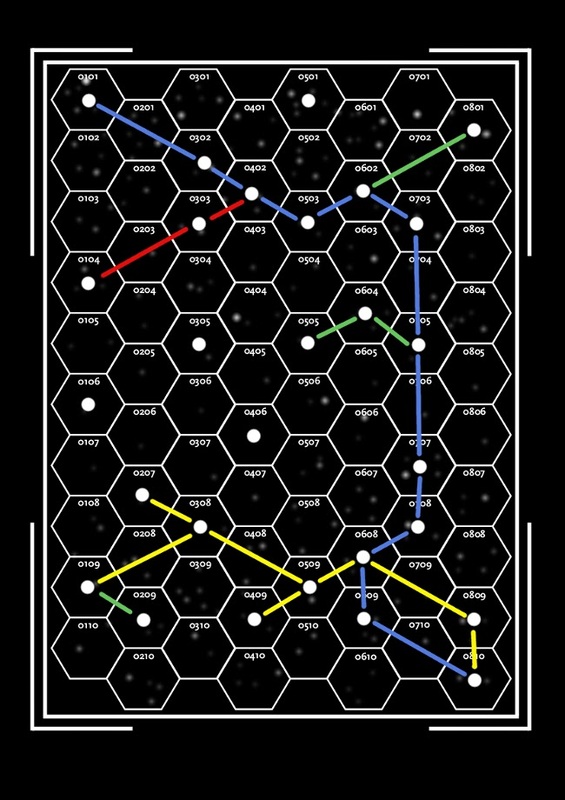 I then set to creating my Sub-Sector using the solid white dots to mark the systems, and connected them all using different colour lines that represent standard shipping lanes. 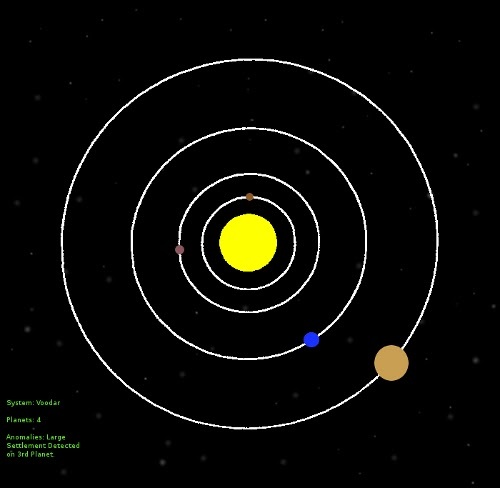 The Blue lines are the Transgalatic Highway. It was constructed by the Interstellar Union before its collapse, the highway is now maintained by the IU predecessor the Galactic Council. The Yellow lines are part of the Outer Rim Shipping Lanes: a local mining consortium. The Green lines are Local shipping lanes that lead to the more travelled back-water worlds. And finally, the Red lines are Galactic Council military channels. With the sector designed, the next step was to design a few systems for my players to visit. 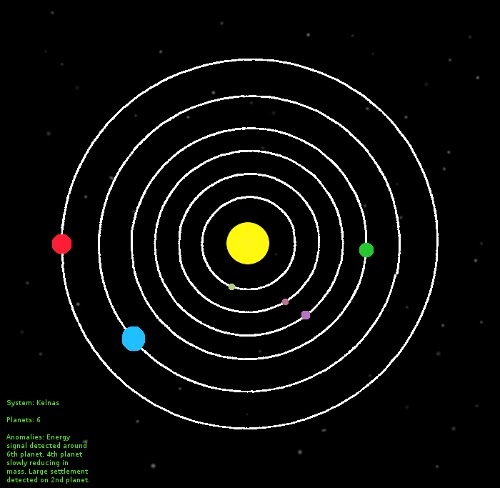 Around that time I was playing a clone of the old DOS game Star Control II, and was pretty inspired by how simply they threw together star systems. SO with that in mind I began creating. Our game began in system 0810: The Orion XII System. Any system with the "Orion" designation is a sort of interstellar truck stop. A place where travellers can stop, refuel, make deals, find work etc. The Orion Class Space stations are a little run down after their almost century of operation, but they are usually a welcome sight for travellers looking for a change after a dreary week in hyperspace. 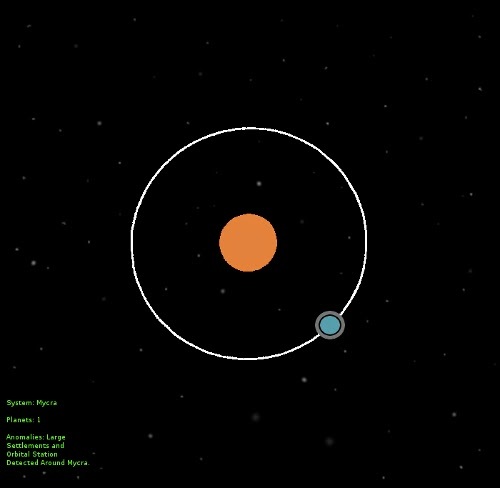 After spending two games on the Orion XII station, The group was finally ready to start exploring the galaxy and set their sights on the nearest star: System 0809, the Kelnas System. 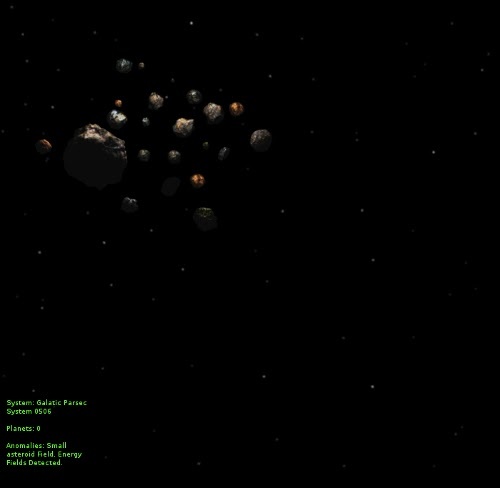 The Kelnas System had a number of interesting planets, but after visiting the junk yard orbiting the 6th planet, they were forced to make an unplotted jump sending them hurling into the sub-sector. From there the game split in two, as the group gained another ship and another series of mis-jumps set them in opposite directions. After getting back to the Trans-Galactic Highway, Dave's character Dry found himself in System 0708: The Voodar System. The Voodar system was fairly unremarkable containing only one populated planet, but Dry found it a useful place to refuel his new ship and gain a new crew member. He also left one of his injured crew members there with the promise of returning for him. Jeff's character Caesar on the other hand was not so lucky and found himself in what was registered as an empty parsec of space. As it turned out the system was not so empty, and containing an asteroid field drifting in open space. Buried deep inside one of the asteroids, Elijah's character's people the Slugulons had built a refuelling. It was just the break that Caesar needed. 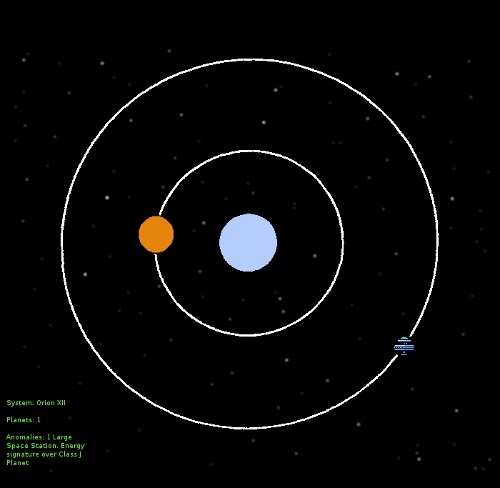 In the soon to be posted Interstellar Exports Game 6 the party is finally re-united in system 0506: The Mycra System. There they ended up on the massive orbital space station that surrounds the entire the planet. Game 6 was full of mishaps, which you will be able to read about soon! Next time we will take a closer look at some of the locations that crew has visited, from planets to space stations, and continue exploring the world of Interstellar Exports.